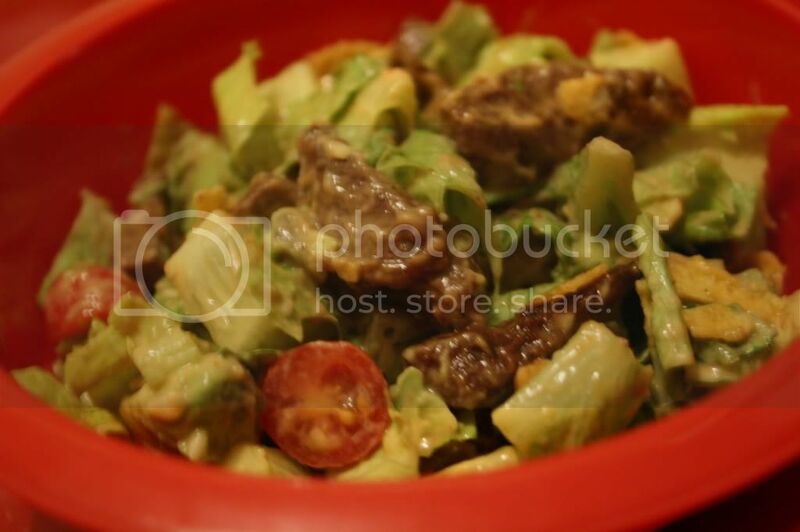 BBQ Steak Salad - Kosher In The Kitch! BBQ Steak Salad - Kosher In The Kitch! Cook pepper steak over low heat with some olive oil. Add the above mentioned spices. (I never measure with spices, I usually just throw in a teaspoon or two) Add a dash of soy sauce. Let it cook together with the soy sauce and spices until no longer pink. (You can also make a marinade of the olive oil, soy sauce and the spices and then cook the meat after it has been marinated) While the meat is cooking prepare the salad. Put the veggies in a bowl, add the taco chips. Combine the BBQ sauce and the mayo for the dressing. Once the meat is ready add it to the salad, toss well and serve while it is still warm.